You want to send an important email and you realize that your data plan is finished. Does it happen on a regular basis and you miss out on important work? Well then, it’s high time that you should switch to unlimited internet plans which are the USP of most of the mobile operators and it’s not about the Internet anymore the new plans will offer you more. This is the first offer in the list, provided by Airtel. Select this pack for ₹ 149 and avail 2 GB, unlimited Airtel to Airtel calls for a period of 28 days. • Unlimited Airtel to Airtel calls are valid for both Local as well as STD calls. • You will also get the added benefit of free incoming calls while on roaming. • 4G Data (for 4G handset only): 2 GB, for 3G handsets users the data is 2GB, if you don’t have 3G/4G handsets then you will get 50 MB. • Post FUP usage, you’ll have to pay extra @0.04/10KB. Airtel 149 Plan only offers On-net free calling which means you have to pay to call other operators. Coming to the second offer in the list by Airtel. This pack is available for ₹ 349 and you can enjoy 28 GB of 3G/4G data for 28 days. 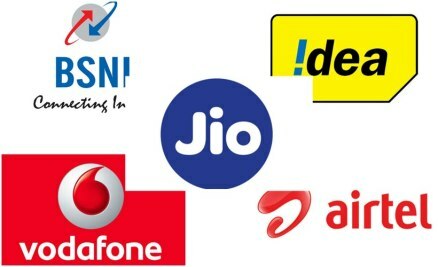 • Unlimited all calls (Local, STD and Roaming) to all operators such as Idea, Vodafone, Reliance Jio, etc. • Daily 1 GB data for both 3G / 4G handsets, other handsets you will get 50MB data. The FUP is 500 MB during day and 500 MB during night (3am – 5am). Moreover, while recharging your account/number, you can try airtel offers and can even earn up to ₹ 50 cash back on your recharge. So, grab the limited offer as soon as possible. Jio, as you all know has been very popular with its internet plans and gave other mobile operators a run for their money. This plan from Jio is for ₹ 303 and you will get UNLIMITED data which will be valid for 28 days. • Unlimited calls (Jio to Jio, Local, STD, and Roaming and to all operators). • You will get unlimited data for 28 days. The data which is available at 3G / 4G speed is only 28 GB. • The FUP limit is 1GB/day, the speed would be 128kbps after you have used 28 GB data or have finished your daily quota of 1 GB per day. Moving on to the other popular mobile operator which is… Vodafone. This first offer from Vodafone starts from ₹ 148 and enjoy unlimited Vodafone to Vodafone calls both Local and STD for 28 days. • Unlimited Local and STD Vodafone to Vodafone calls and Vodafone to another operator will cost you @ 1paise per second. • You will get 2 GB 4G data (4G Handset + 4G Sim), 300 MB only for 4G Handset and 50 MB if you don’t have 3G / 4G compatible handset. • Another benefit of this plan is that you will get all Local and National SMS @ 25 paise/SMS for 28 days. This is the most popular plan among youth and Vodafone has nailed it with this plan. The second plan in this list will cost you ₹ 348. You will enjoy UNLIMITED calling to all the operators. The plan is valid for 28 days. • You get Unlimited Local, STD Vodafone to Vodafone and plus unlimited calls to other operators as well which include (Airtel, Jio, Idea, etc). Customers using more than 300 minutes per day will be charged @ 30p per minute for both Local and STD. • You will get 1 GB per day 4G / 3G data. Customers who have purchased new 4G handsets will receive additional 9 GB 4G data. It is same 50 MB if your handset doesn’t support 3G or 4G. How to avail these packs? 1. Liked the above offers? You can recharge these plans via your nearest recharge shop and get your recharge done successfully. 2. You can even recharge your number through your desired e-wallet account (Paytm, Mobikwik, FreeCharge) and can also apply the available offers on the e-wallets. 3. You even visit their official mobile apps such as MyAirtel app in case of Airtel or can directly login via their official websites. How to activate your plans with E-wallets? • Login to your Paytm/ FreeCharge/ Mobikwik account. • Choose the Vodafone ₹ 348 plan or Airtel 28 GB Combo 3G / 4G Data Pack which you want to activate. Browse for more offers and choose your state as the plan varies from circle to circle. • Apply promo code, if any and click on proceed. • Complete the payments via the given methods. Every mobile operator is giving a tough competition to each other as you can see from the above plans. All the above-mentioned internet plans are best and there is not much difference in them. You can choose the plan which fits your requirements. Liked the article? Feel free to share and which plan works best for you? Mention in the comment section.